Today it is Shrovetide Sunday (Fastelavnssøndag) here in Denmark. What does it mean ? Shrovetide bun are connected with fasting, which starts 49 days before Easter. And when in the fast period you are not supposed to eat meat and wheat flour as well as not drink milk or alcohol. So before the fast started there was big parties, where you would indulge in these foods. Fastelavnssøndag (Shrovetide Sunday) and the following Monday were the last days, where you could eat meat. The following Tuesday was the last day of eating wheat flour, where here buns were baked and eaten. This White Tuesday is also known as Pandekagedagen (Pan Cake Day) again relating to the use of wheat flour in pan cakes. 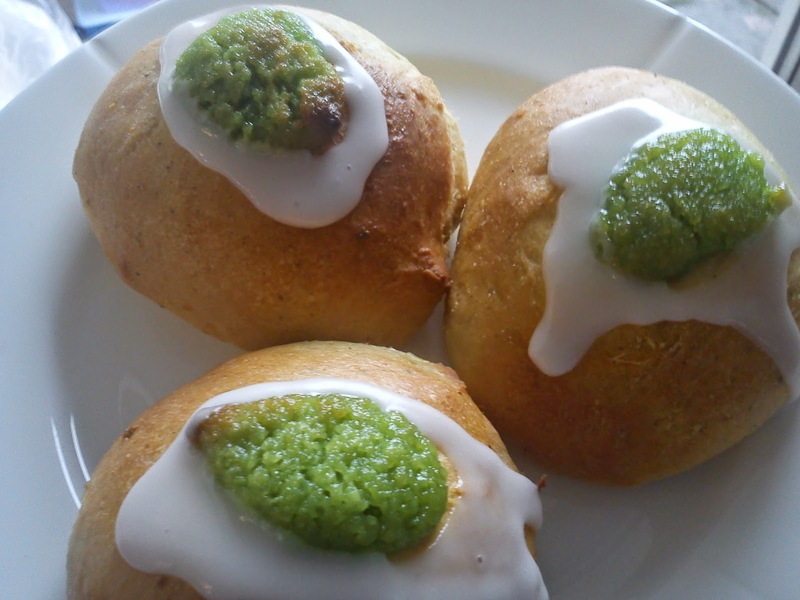 This year I have decided to try out this suggestion for Shrodetide buns using a a very fat rich bun recipe combined with pistachio mass as filling. Pour dairy cream and water in the mixing bowl of the stand-alone mixer. Dissolve the yeast into the yeast into this liquid by stir with a spoon. Weigh salt, sugar, vanilla sugar and eggs into the liquid. Make a smaller hole in the upper part of the bun. Squeeze in the pistachio marzipan into the hole. Cool down the buns, before decorating them with white glazing around the pistachio marzipan.